Written by Adam Cadre. Winner of three Xyzzy Awards, including Best Puzzle of 2002. [i]You are locked in a cell. You are the head of security for a dungeon. It is your job to keep it secure against pesky adventurers. 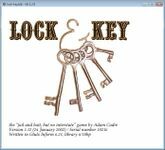 Lock & Key is unusual in creating a graphical interface to help you keep track of the traps, minions, and other pitfalls that you can introduce against the incoming hordes of do-gooders.